It has recently appeared in the news that Ted Baker have teamed up with the famous bicycle producers, Quella. Together, they are set to create three stylish bespoke models which are predicted to outdo Santander Cycles. Each of these three new bicycle structures feature copper plating, steel frame, and will have a Brooks England leather saddle. The bikes will be available in red, green and blue and have been named after fish due to the bikes being inspired by the ability salmon have to swim upstream – Redfinn, Bluetail and Greengill – Well, for the £1,995, you’d expect a pretty name, wouldn’t you! 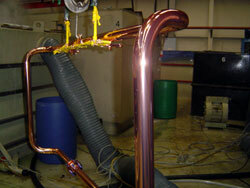 Copper plating is used for both functional and decorative reasons. Traditionally, it is used for electroforming but can also be used for Electro Magnetic Interference (EMI) and Radio Frequency Interference (RFI) shielding purposes. The reasons for this are because copper is a brilliant conductor and its deposits from copper plating are very bright. It also has excellent levelling properties and naturally kills bacteria which is why it is used so frequently in laboratories to plate medical equipment. The aesthetics of copper plating are used due to its bright, highly polished copper-pink appearance which can be lacquered in order to prevent the copper plating from becoming tarnished if it is intended only for decorative purposes. Here at us, we are experts in the process of copper plating as well as the process of electroless nickel plating (ENP). We have a friendly and professional team, who are happy to help you with any query you may have. If you have any questions regarding copper plating, electroless nickel plating or any other of our services or if there is something you or your business would like to find out more about, contact us today on our phone number, email us at info@metal-finishing-company.co.uk or alternatively you can click here to go directly to our website. As another option, you could use the following links to go directly to information most frequently asked for regarding the services we provide, such as diffused nickel plating, copper plating, shot blasting and heat treatment.